I bet you got all your baking scheduled for the holidays, still the Bread Baking Babes would like you to consider this one. 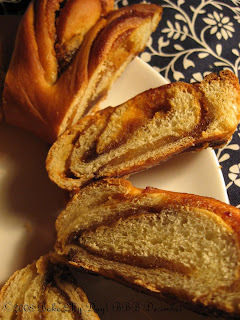 It is such a versatile, easy to do-great effect bake that you might as well fit it into your schedule. 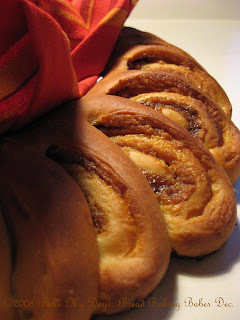 Either savory or sweet the Swedish coffee ring could be just that addition to your lunch, breakfast or afternoon tea. Cookie Baker Lynn heads of our Kitchen table this month and from her Kitchen came this recipe. Stir yeast into the milk, add sugar, butter, egg, cardamom, salt and 2 cups of the flour. Beat until smooth. Stir in enough remaining flour to make dough easy to handle. (I didn't use all of the flour). Turn dough onto lightly floured surface: knead until smooth and elastic, about 5 minutes. Place in greased bowl; turn greased side up. Cover and let rise in warm place until double, 1 to 1-1/2 hours. Punch down the dough. Roll into rectangle, 15 x 9-inches, on a lightly floured surface. Spread with your filling to within 1/4-inch of the edges. Roll up tightly, beginning at the wide side. Pinch edge of dough into roll to seal well. Stretch roll to make even. With sealed edge down, shape into ring on lightly greased cookie sheet. Pinch ends together. With scissors or kitchen shears, make cuts 2/3 of the way through the ring at 1-inch intervals. Turn each section on it's side (90 degree turn), to show off the pretty swirled filling. Cover loosely with plastic wrap sprayed with cooking spray. Let rise until double, about 40 to 50 minutes. Heat oven to 350 deg. F. Bake until golden brown, 25 to 30 minutes. (If it browns too quickly, cover loosely with aluminum foil. )When cooled drizzle a simple glaze over the wreath: Mix until smooth: 1 cup powdered sugar 1 Tbsp water 1/2 tsp vanilla (add additional water 1/2 tsp at a time, if necessary). My sweet filling consisted of thinly rolled discs of marzepan, a drizzle of caramel, sprinkling of brown sugar and a mixture of walnuts and hazelnuts on top of that. I made a savoury one as well, used thin cuts of ham, topped with sauteed lean ground beef seasoned with cumin, pepper and salt, nutmeg (drained to get rid of excess fat), sprinkled some cheese over it and proceeded to shape it in the form of an "S" to celebrate our Sinterklaas evening. Made some changes to the dough, substituted the butter for 3tbs olive oil, used somewhat more liquid and added herbs to the dough itself, omitted the cardamom and left the sugar out but for 1 tbs. 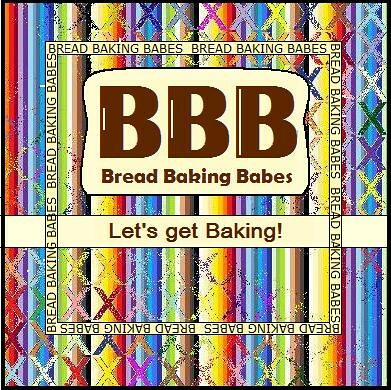 Edited for Buddy date: Bake with us and be a Bread Baking Buddy! Submit your entry by sending a mail to Cookie Baker Lynn by 31 December. Oh Karen yours looks so perfect and the big "S" for savory, how clever of you. I've got another one rising right now for breakfast this morning. It is a savory one and my dad keeps wandering into the kitchen wondering when it will be done. We all knead to bake this one again (and again). The visual gives such great bang for the little work. Love your S or the Dutch Santa. I wanted to make a savoury one but alas, I have to be content with yours which sounds great! Your wreath turned out beautifully and your filling choice sounds heavenly. Great job! Your wreath is so pretty, and I love the "S"! Well done! Great wreath/S, both of them. I love sweet you know that, so a filling with marzipan really sounds good to me. But minced beef with those spices... yeah, my dinner is still in my stomach but getting an appetite again!! 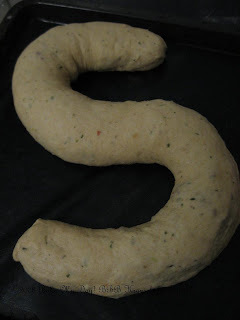 Is that "S " for Smakelijk ? this really looks yummy. I like the idea of doing a savory one. Need to look how I can do a one person version of it too, can't wait to give it a try. Astrid; maybe you could make these into two-bite-sized snacks? Follow the guidelines but instead of shaping into a wreath make one long roll, slice into 3 inch and cut just one long side to show the filling? This one freezes well. Your fillings sound so wonderful - I really want to try a sweet one now. I especially like your caramel idea, delish! Happy New Year to you and yours. Yes Howard, unfortunately I do mind! This article is not to be shared. Anyone who's interested in a "how-2" can contact me.